Julia's Bookbag: Oh yes. Bran muffins. We're nothing if not exciting around here. Don't run away, please don't. I would like you to know that these are not dry, nasty, brick-like muffins. They are lovely. They are light. They go so nicely with jam. They won't make your tummy feel like you just put a bucket of lead inside of it. I did a bit of a sneaky, bad trickstery thing to my brother this past Christmas. I gave him something I wanted. Something I knew he wouldn't care about terribly much. I gave him Heidi Swanson's 'Supernatural Every Day' cookbook, which I had been hankering after for ages and ages. Her Baked Oatmeal has been passed around, and made, and re-made and pinned on Pinterest, and re-blogged and shared to such an extent, it has become A Recipe of Legend. And as I suspected, when my brother left to go home after Christmas dinner at my house, guess what was sitting left behind on the sofa? Yep. AND NOW IT IS MINE. ALL MINE. But I am willing to share. I intend to be cooking from this cookbook a great deal this year. I've decided that I have a new plan for my cookbooks. Instead of making a recipe here and there from my various books, and forgetting about their existence for 95% of the time, I'm going to pick a book, and just go straight through, cooking from it exclusively. I think this is the only way to really get good use from my HORDE of cookbooks. So try these bran muffins. They are tasty and good for you. This is a good thing. They are just as Heidi describes them, with a light crunch to the outside, and a tender and light crumb inside. Preheat oven to 400 degrees, with a rack in the middle of the oven. Generously butter a standard 12 cup muffin pan. In a large bowl, whisk together the eggs, buttermilk, melted butter, and maple syrup. Sprinkle the bran and cereal across the top, stir, and allow the mixture to sit for 5 minutes. In the meantime, in a separate small bowl, whisk together the flour, sugar, baking powder, baking soda, and salt. Sprinkle the dry ingredients over the top of the wet and stir until just combined. Immediately fill each muffin cup three quarters full. Enjoy, my friends! And check out Heidi's amazingly great blog, 101 Cookbooks. 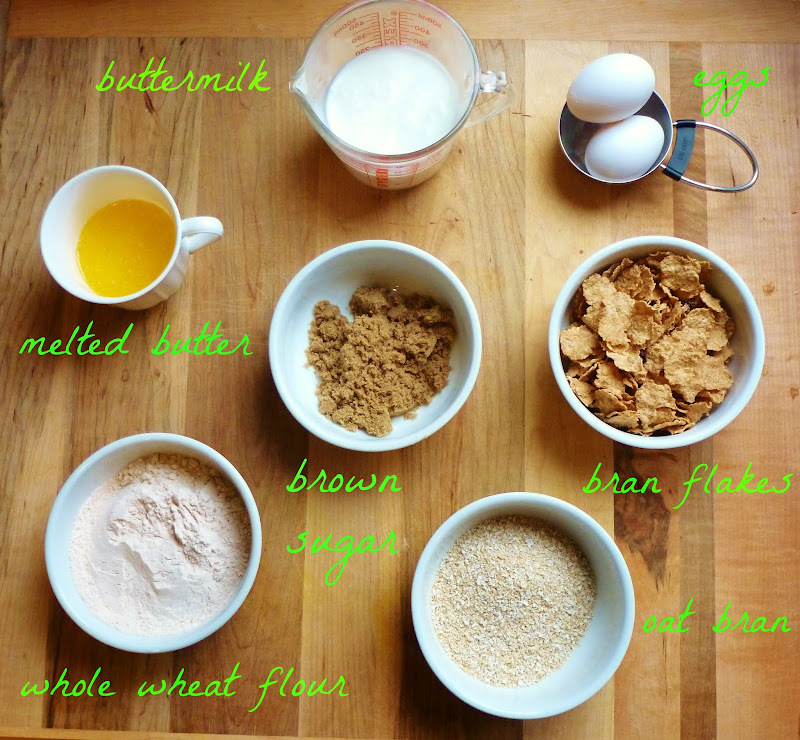 This recipe looks like a good way to sneak... er.... introduce bran into one's diet. The muffins look yummy. Are they just as good the next day or best the first day? Oh yes, they are great the next day :) Actually, here's another confession ~ my brother has this weird thing about being careless with his presents from anyone and he ALWAYS leaves them at our mom's house or my house...so now I make sure to give him either food type items or something I like, so that someone will get use out of it when he leaves it behind! So whenever I think of bran something-or-other (especially oat bran), it takes me back to late-'80s Thirtysomething-era, and the big oat bran craze. And Colon Blow cereal on Saturday Night Live. So that's where my mind just went! That said, they sound pretty tasty. Oh my gosh I forgot about that SNL skit, so funny! HA! That is some hilarious trickery! I used to love to bake... it was kinda my thing. Somewhere along the road I lost that love. (I think it may be the too many cooks in the kitchen dilemma) maybe one day I'll love it again. Bran muffins always remind me of my Grandma's Raisin Bran Muffins that were so awesome. If I had any buttermilk in the house you would have me baking right now. Also, I like your idea of cooking through a cookbook idea. There are so many recipes in my books that I never have made "because I don't know them." I have to remember to do this once my kids are a little more willing to at least taste new things. SOOOOOOOOOOOOOOOOO going to try this recipe!!!! I tried to make some the other day based on the recipe on the pack and it tootallllly sucked. Thanks sugar! These look amazing!! I will for sure be trying these out soon! My mouth is watering already! Thanks for that link! One can never have too many (good) recipes or ideas for meals!